During her treatment for cancer, Mary Anne Schwalbe and her son Will spent many hours sitting in waiting rooms together. To pass the time, they would talk about the books they were reading. Once, by chance, they read the same book at the same time—and an informal book club of two was born. Through their wide-ranging reading, Will and Mary Anne—and we, their fellow readers—are reminded how books can be comforting, astonishing, and illuminating, changing the way that we feel about and interact with the world around us. 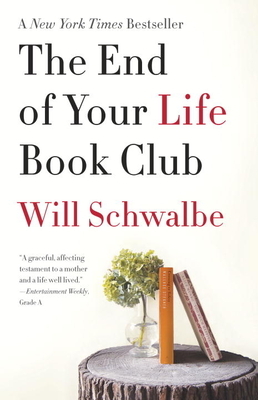 A profoundly moving memoir of caregiving, mourning, and love—The End of Your Life Book Club is also about the joy of reading, and the ways that joy is multiplied when we share it with others. Will Schwalbe has worked in publishing (most recently as senior vice president and editor in chief of Hyperion Books); digital media, as the founder and CEO of Cookstr.com; and as a journalist, writing for various publications including The New York Times and the South China Morning Post. He is on the board of the Kingsborough Community College Foundation. He is the coauthor, with David Shipley, of Send: Why People Email So Badly and How to Do It Better.